Harris Corporation has introduced HView™ SX Pro, a scalable, highest-density multi-display management system for the broadcast industry. The HView SX Pro extends Harris’ HView multiviewer range, delivering a signal processing and monitoring option for control room environments. Its compact design reduces space, power and complexity while offering high picture quality and flexible control options. Its high-density design accommodates more sources and outputs in fewer rack units to reduce system and installation costs. Harris customers can use the HView SX Pro as a standalone solution or integrated within Harris® Platinum™ routers. The HView SX Pro offers low-latency processing and enhances image quality through Harris MicroFine scaling technology. Built-in control features maximize display options, from single-surface video wall configurations to multi-unit or multi-room systems. 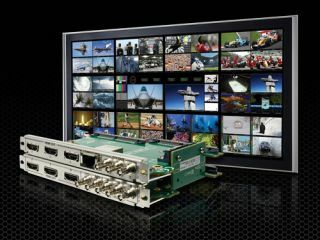 The Harris SX Pro will debut at CABSAT 2012, taking place February 28 to March 1 at the Dubai International Convention and Exhibition Centre (Stand S3-A21, Sheikh Saeed Hall), and will follow in North America at the 2012 NAB Show, taking place April 14-18 at the Las Vegas Convention Center (Booth N2502).